Homes, apartments, and offices are typically ill-suited to the needs of plants. 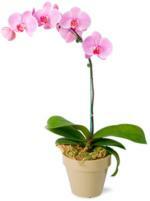 At the nursery, indoor plants are grown under nearly ideal light, temperature, and other conditions. Two key factors in successful indoor plant selection are choosing plants that can tolerate the indoor conditions of a specific location and acquiring the knowledge necessary to maintain the chosen plants in a healthy condition. Our gratitude to Steven Swain (Environmental Horticulture Advisor, University of California Cooperative Extension, Marin County) for providing content for the Indoor Plants section of the California Gardening web site.